"OU FILMMAKER HAS HEAD IN THE CLOUDS"
Can a cloud be exciting? One must look with the right kind of eyes, like with the rural-raised retinas of stormchaser Joel Taylor, or possibly through the bug-eyed lenses of his cohort, Reed Timmer. These two University of Oklahoma meteorological students were the focus of a recent documentary by fellow meteorologist and OU journalism grad student Ken Cole. Cole’s documentary, “Tornado Glory,” follows Taylor and Timmer in their quest to film extreme weather footage. Taylor does the driving while Timmer shoots the storm footage, which he then sells to television networks. 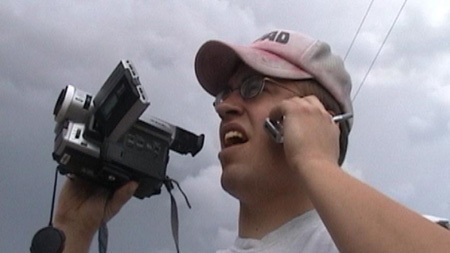 Cole, who knew his subjects through school, began documenting the duo’s chases on video in January 2003.
in Ken Cole's Tornado Glory. Things like filming out the driver’s side window while the passenger drives, being within an 1/8 of a mile of an active funnel and chasing a storm at over 100 mph on a wet road have earned Timmer his bad boy reputation. But Cole’s movie portrays Timmer’s eccentricity as being born from a love of meteorology and not just a thrill seeker’s search for a rush. However, stormchasing can satisfy a rush junkie’s cravings. A lot of it is driving and waiting, but then the clouds begin to drop, rotate and finally form a funnel from the sky to the earth. In one scene, a grove of trees in the distance disappears under the fist of a spinning giant which developed in this way. Watching it on the screen, one gets a sense of the charged atmosphere witnessed by the characters. They must shoot as much good footage as possible, but they can’t overstay their welcome in the face of Mother Nature’s most furious creation. At one point, the team is confronted by a man whose house has been destroyed by the tornado they’re chasing. It makes their pursuit seem petty in the face of the reality of loss. Still, the blame falls on no one, and Timmer and Taylor remain shameless in their hobby, squeaky windshield wipers and all. “The whole reason why I did this was so people could see what storm chasing is really about, and what it’s really like,” said Cole. “A lot of people have seen ‘Twister’ and that’s kind of what they think of storm chasing. But if they see this movie, I think they’ll have kind of a different idea of what it’s like. “Oklahoma is a unique place for a movie like this; you don't need special effects for tornadoes here. I find the reality much more intriguing than what Hollywood comes up with,” said Cole. “Tornado Glory” is an official selection in the traveling 2004 New York International Film Festival and premiered July 23 in Las Vegas, Nev. It also will be screened in Los Angeles in early October.